The first UK project from EAA-emre Arolat Architecture has been submitted for Planning. This project designed for Allies London is a complex residential development comprised of an ensemble of new and existing buildings. The base building has been designed to engage with the street at the aggressive junction. The double height ground and first floor expression accommodates inset terraces and balconies above. 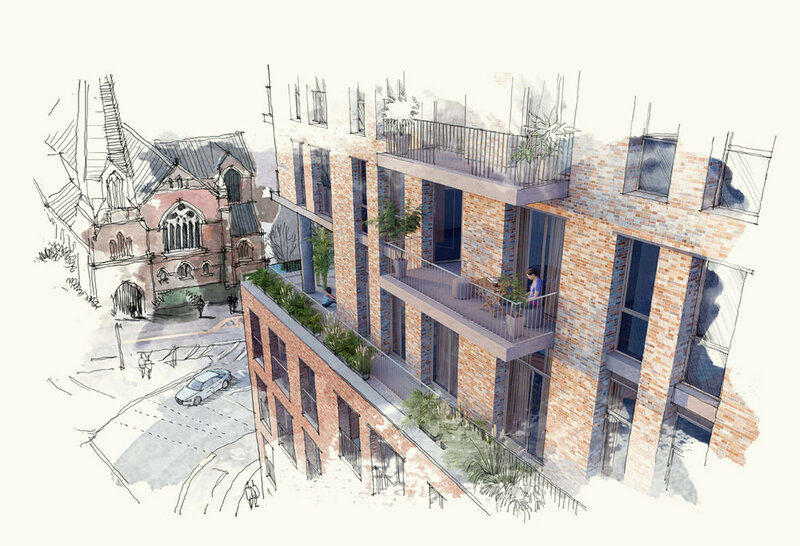 the upper floors have been set back to maintain a 5-storey shoulder on the street and respond to the views of the grade II listed Church. The linking building extends across the existing building to form a lightweight extension, whilst cutting into the new building to form a terrace. The link building has been designed to have a special foreign identity, a lightweight filigree structure with closing, void and brick infill. This view of the link building with a sloping landscape into the building creating an open and overlooked streetscape and transparent lobby appearing as an extension of the public realm. The link building cuts into the upper building at the 5th floor which is augmented by a cut into the building and continuous roof terrace around the building creating a green highlight softening the rigorous language of the architecture. The development has been designed as an ensemble of buildings of the same family but with a unique identity. The builds are composed of two bricks combined in different proportions for each building. The upper building has external balconies to contract with the formality of the base building. The teller building becomes lighter with a greater proportion of grey bricks used in the blend. 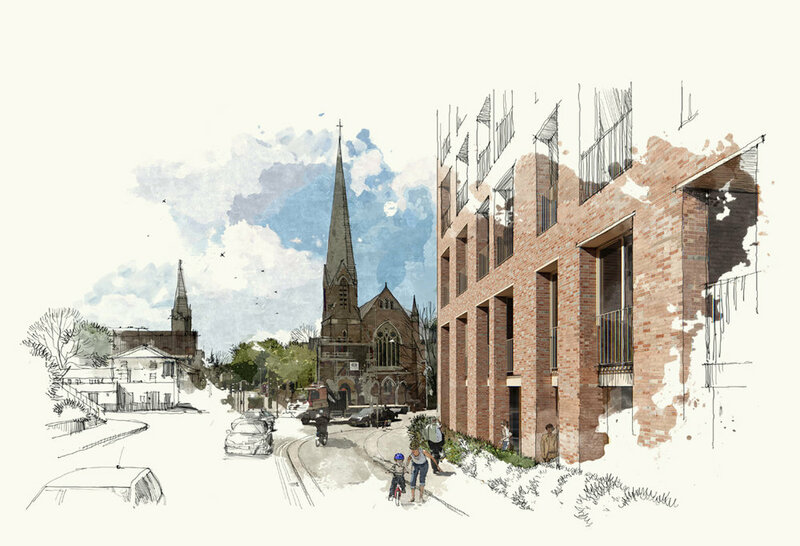 The stepped buildings create a calm backdrop from the Conservation Area adjacent to the site. the brick tones borrow from the grey-and-red tones of the period properties and church.